Other number 019745 CED SCS24225 0498 Upper right hand corner of backside of card. Other number 4463 3300 0100 0952 Back of card. 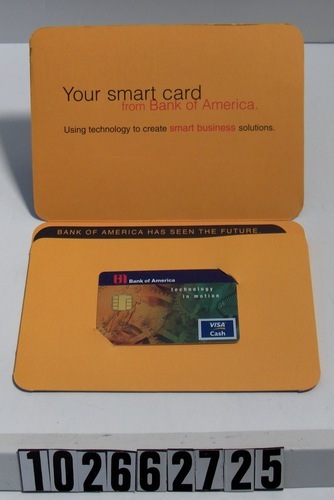 Object consists of Visa Cash card and pamphlet that reads, "Bank of America Technology in Motion Smart Card." on front cover. Inside of pamphlet has two pull out cards that explain the card's use, and the standard credit card sized card.